Increasing equity of access and opportunity for all students in all schools. Engaging student participation through the review process and reflecting student voice in programming decisions. Designed consultation format and developed guiding questions to engage students in a conversation about the Secondary Program Review which will determine the conditions required to create exemplary secondary school learning environments that provide: equity of access, engagement and inspiration, pathway planning that positions students for success and results in equity of outcomes and programs that are creative and innovative. Hosted four Student Voice Consultation Sessions – one in each Learning Centre – to understand the focus of the review and how students could engage their peers. Trained students to host their own Speak-Up Forum to broaden the outreach with secondary students. Initiated a year-long collaborative inquiry involving 16 schools to actively engage with each other and provide support around Delayed Pathways. This included learning first-hand from schools that have already successfully de-streamed their programs. We have deepened our understanding about the possibilities and potential for de-streaming – where all Grade 9 students take core courses at the Academic level – and are continuing to use this as an opportunity to understand what we can do as a system to support this. Choice of Program - This ranges from choice of course content to method of delivery, students are asking for more comprehensive choices than what has traditionally been available. There was a focus on personal finance, skills that are immediately relevant in the lives of students at a young age. Quality of Instruction - We have heard many comments about the quality of instruction. Students also mentioned favoritism in class and some gender inequity; lack of differentiation that is meaningful; teacher seen as holder of knowledge and a gatekeeper to next level, but not necessarily a partner for students. Access to Opportunity - This includes physical access to all aspects of school and learning, and also access in terms of all students receiving the same opportunities, as opposed to what currently happens - only the "chosen few" are selected, leaving others out consistently. Focus on Equity- Students appreciate the recent focus on equity in schools, but want to see this go deeper and be more inclusive. Not enough has happened to get our schools into a truly equitable place, and they know it, and they want to know how to improve this. Review and implement changes to the admission procedures for all specialized schools/programs. Review French programs across the TDSB. 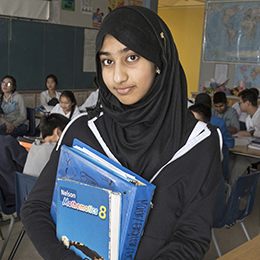 Assess impact of the de-streaming initiative that is currently underway in a number of TDSB secondary schools through the Structured Pathways project. Partner with postsecondary institutions to expand Dual Credit programming in all our secondary schools. Disseminate report on Student Voice and confirm next steps. Report on Student Voice and program scan in every secondary school.